Hundreds of students waited excitedly to be addressed by Prof Dan Kgwadi, NWU vice chancellor, Prof Fulu Netswera, director of the Business School, and Prof Job Mokgoro, Premier of the North West province. Prof Mokgoro gave the opening address on “Delivering Public Services in a VUCA World”. According to Prof Mokgoro a VUCA world is described as an environment that is full of Volatility, Uncertainty, Complexity and Ambiguity. “In order to navigate from the VUCA environment, leaders and decision makers need to push back on demands so they can take immediate action. 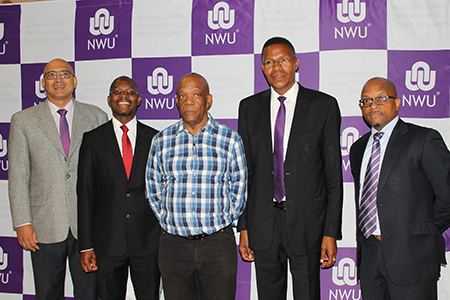 Meaningful factors need to be separated from factors that are related to the core issue,” said Prof Mokgoro. According to Prof Kgwadi, the NWU Business School is one of eight South African business schools and among the 257 business schools worldwide that are accredited by the Association of MBAs (AMBA). He added that AMBA is an important association that is not only recognised by business schools, but also by corporate and public sectors. “To the new MBA students, I would like to assure you that you have made the right choice by choosing the NWU. When you graduate with this qualification you are assured of local and global recognition,” said Prof Kgwadi. When asked why he chose the NWU, he said that – apart from the qualification being recognised internationally – the reputation and affordability of the course motivated him to apply. Prof Daryl Balia, deputy vice-chancellor on the NWU’s campus in Potchefstroom, Prof Fulu Netswera, director of the Business School, Prof Job Mokgoro, Premier of the North West province, Prof Dan Kgwadi, NWU vice-chancellor and Clement Manoko, executive director for Corporate Relations and Marketing welcomed MBA students during the recent open day.